The junior staffs at Ben-Gurion University of the Negev and Tel Aviv University began open-ended strikes on Sunday, October 14, over pay and working conditions. Similarly, the Union of Junior Academic Staff at Tel Aviv University published on Facebook last Friday: “On Sunday at 9 am all of us will be present at a protest in front of the university gates to stop studies for an unlimited period. 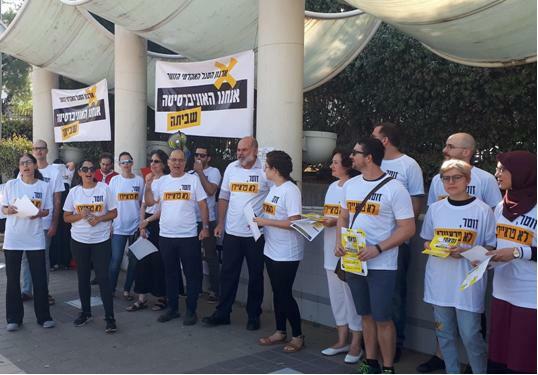 We are fighting together for fair working conditions and for the academic future of Israel.” The Tel Aviv University union has approximately 5,000 members and is the largest workers’ association at the institution. Those participating in strike action are primarily teaching assistants, teaching fellows and lecturers. In September, following a year and half of negotiations, junior staff unions at Jerusalem’s Hebrew University and Bar-Ilan University announced a collective agreement with the Committee of University Heads, which they say will see wage rises over the next three years and greater employment security. Junior staff members at Haifa’s Technion – The Israel Institute of Technology – are said to be in advanced negotiations over a similar agreement. Rejecting such agreements, the Union of Junior Academic Staff at Tel Aviv University said it would only worsen their current situation, as it includes only gradual wage rises, and is contrary to employment law as it refuses to pay workers for sick days and bereavement leave. The unions of junior academic staff at public colleges have also announced a work dispute in an effort to improve their members’ employment conditions. The colleges to be struck include Sapir College, Kinneret College, Ruppin Academic Center, the Kibbutzim College, the Holon Institute of Technology, Achva Academic College, the Tel Hai Academic College and the Ashkelon Academic College.